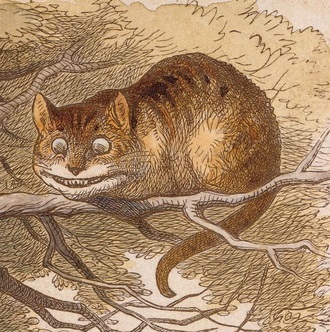 I think that the most current graphic for Alice in Wonderland‘s Cheshire Cat is much more adorable than the original illustrated one in 1866. He is so adorable that he now graces my desktop on my computer as well as being the wallpaper on my phone. 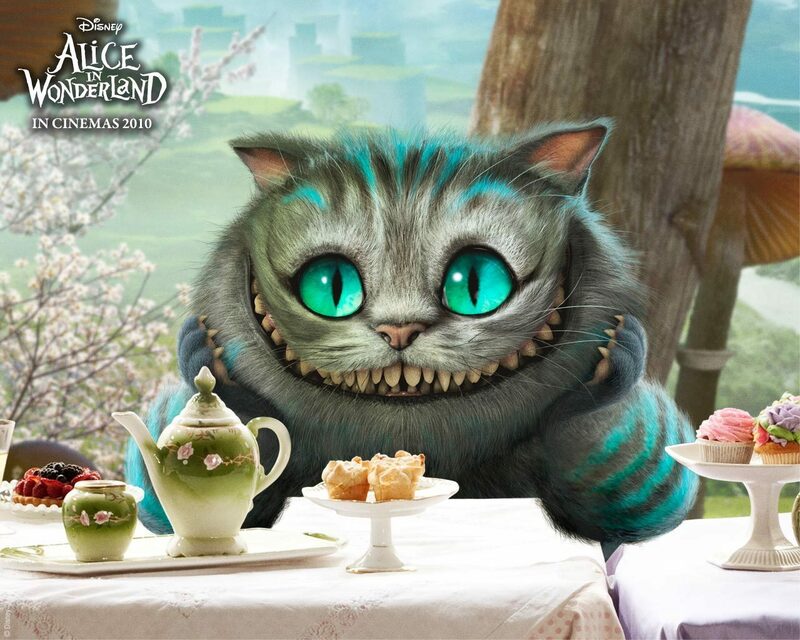 From Wikipedia: The Cheshire Cat is a fictional cat popularized by Lewis Carroll in Alice’s Adventures in Wonderland and known for its distinctive mischievous grin. While most often celebrated in “Alice”-related contexts, the Cheshire Cat has transcended the context of literature and become enmeshed in popular culture, appearing in various forms of media, from political cartoons to television, as well as cross-disciplinary studies, from business to science. One of its distinguishing features is that from time to time its body disappears, the last thing visible being its iconic grin. I highly recommend viewing Tim Burton’s 2010 version of Alice in Wonderland http://www.imdb.com/title/tt1014759/ to see the magic and beauty of this fairy-tale brought to life. Frank and Louis, a two-faced cat, lived 15 years despite the owner being told that the cat would not survive long. The cat had two noses, two ears, two mouths and three eyes. The Janus cat died in early December 2014. Indulge myself more in smelling the underwear in the laundry basket before they are washed. Will avoid the bathroom sink when hair dye is detected. Let the dumb white kitty win a few times at wrestling. Execute new plans to stalk and kill anything that moves in the garage. Finish shredding the window screen in the living room. Will become more stealth in breaching the man-cave to hide in secrecy. Working at the small mom and pop sign shop had its joys and challenges. The business was located in a very large warehouse called The Incubator. It existed in order to help small businesses in their new beginnings; however, the sign shop had stayed there passed its allowed time. After all, my employer had built separate office spaces for the business and owned some heavy duty equipment. One just didn’t pack all of that up and leave at a moment’s notice. It wasn’t a bad job. It did sometimes create a problem when an employee decided to spray paint something just outside of the office door which caused it difficult to breath. Fortunately that didn’t happen too often. In the time of my employment there, a feral cat had given birth in a secret place of the warehouse. There was even a cat fight that took place just on top of the ceiling tiles of the “vinyl room”. Over the course of a couple of months, we noticed the little kittens running on the property. They loved to play in and around the forming tubes that were used for concrete columns. The mother cat was eventually caught and taken away by the local Animal Control. She couldn’t be placed in a home since she was wild. She had to be euthanized. Her litter of kittens ran loose for the moment. One day as I sat at my desk while I paid the bills for the company, an employee asked me to follow him to the outer porch area. He motioned for me to look inside of a cardboard cement forming tube which was standing vertically. When I looked inside, a half of a dozen pair of little kitty eyes looked back at me. All of them had black fur with white paws, all except one. It was a male kitty with patches of gray tabby and patches of white on his face and body. He stood out from his little brothers and sisters. My heart melted. With a leather utility glove on my hand to protect it, I reached in as far as I could. I could only grab his little head to pull him out. He didn’t squirm at all as I brought him out. I placed him in a cardboard box until I could take him home. He was so scared that he stayed in it. I put my long sleeved jean shirt over a portion of the box in order for him to get used to my scent and to make him feel safe. When I arrived home and parked my truck, I donned the jean shirt in order to conceal the cat until the big reveal. When I entered my house, my husband, Bob, was on his computer as usual. I stood in the doorway with a smile on my face. As I pulled back my jean shirt, the cat’s little head popped out. Bob made a face as he said, “Oh, no!” in mock dismay. Whatever he felt for the new kitty would soon change in a month or two. They would become best buddies. Our new kitty was named Rambo after the movie character John Rambo because it seemed like he wasn’t afraid of anything. 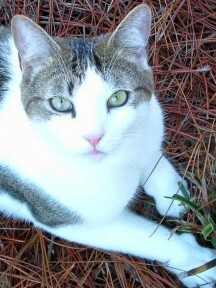 Rambo would spend time outside with me as I gardened, trimmed the yard or planted trees. He would walk the entire perimeter of the backyard along the privacy fence as if to check that everything was alright in his world. Or perhaps he was in search of lizards to chase. I soon learned that cats are creatures of habit. Some habits are welcome while others are irritating. Little did we know that some things we would allow, such as allowing Rambo to come and go outside as he pleased, would later make us regret allowing him in the first place. His begging caused me to resort in using a pair of house slippers with little monkeys on them. When you pressed a button on one of the slippers, it made a sound like a jungle monkey. Rambo would run from it. Rambo’s habits that gave me joy were sitting on the floor behind me against my heels as I put makeup on for work; playing in the dark before I went to sleep; crawling on my chest to have me rub his forehead and eyes; and being sprawled out in Bob’s lap at his computer with a look of contentment. After being with us for eight years, we noticed that Rambo was becoming obese. We just thought that he was a big happy cat. As many cat owners do, we left dry food out all of the time, his only source of food besides treats. He developed liver disease and diabetes. He soon stopped eating altogether. Force-feeding him only delayed the inevitable. He recovered for a few months until he had a relapse, causing him to stop eating again. We understood then that the illness was winning. But I lied to myself. The vet will make him better, I thought. Maybe the vet could give Rambo another saline treatment to hydrate him. But as I sat there at the veterinarian’s office with my dear buddy in his carrying case, I realized that I had to let him go. I had to do the right thing. I went to the front desk of the vet’s office and made arrangements to euthanize him and dispose of his body. I paid for these services up front. A large man took the case from my hands, disappeared, and reappeared with an empty carrier. It was all too professional and void of any sense of caring. I was in a fog. I walked down the hall to exit the building. Once I set foot on the sidewalk, a scream was wrenched from my body as if I had been stabbed with a knife, as if an unknown part of me had just woke up and wanted to be heard. I placed the empty carrier on the passenger seat of my truck. When I got into the truck, I cried and screamed some more. Knowing that I had to drive myself home, I finally pulled myself together and turned the key in the ignition. How could a pet have such an effect on a human? Did I really choose him or did he choose me? Did God bring him into my life to teach me how to have fun? To love more? To care more? Try as I could, there were no other cats like Rambo for me to adopt either online or at the local shelter. I eventually found an orange and white short haired kitty that filled the hole in my life. Again, God brought another special creature into my life to heal me inside and out after a much needed operation. In the overall picture, God knows the desires of our hearts. Like James 1:17 says, “Every good and perfect gift is from above, coming down from the Father of light…” I thank Him every day for these gifts, even if it is wrapped in fur with green eyes and a really mischievous disposition. 5:30 A.M. (or any time before) – wake mama human up that feeds me. If kicked off the bed, wait a few minutes, crawl up to be petted. 6:00 A.M. – If human hasn’t gotten up, climb on night stand or rattle blinds in the window. Eat in the garage and bide my time until mama lets me out before she leaves. Wait for daddy human to get out of bed. Follow daddy, jump on window sill, peak out of window with human. Sit at kitchen pass through window to watch daddy human make his protein drink and wash the blender. Bring toy to daddy while he drinks protein shake; play fetch-the-toy with human. Watch daddy get ready for work. Loiter by the door and roll on the floor acting cute to keep him from leaving. Settle at the patio door to be on the lookout for lizards and birds. Choose a place to nap away the day. Bring one or more toys to the water and/or food dish; let them have a taste. Wait on the stool under the window to see humans come home; claw at the window when they come to the door. Have dinner with the dumb white kitty. Sit on the bathroom sink as human takes out her contact lenses or washes her hands. Drink from her cupped hand. Chew on things on the counter. Challenge the dumb white kitty while humans eat dinner; beg to go in the garage for “me time”. Go into closet. Scratch the walls. Get into general mischief. Play chase-the-kitty-food morsel when mama throws it into dining room for me to chase. 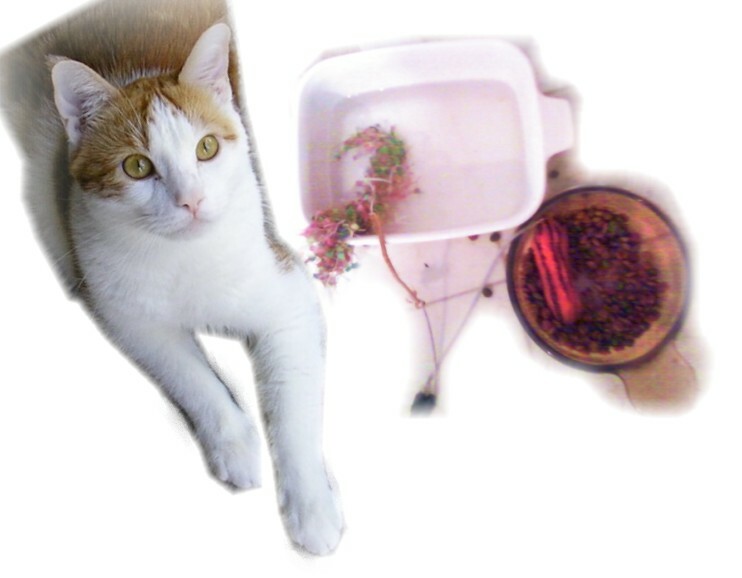 Otherwise, play hockey with dry food in kitchen and hide morsels under the rug at the kitchen sink. Jump on bathroom sink when mama brushes her teeth; squeeze in there for a drink from the faucet or from her hand. Wait ‘till humans are in bed with the lights out to jump up on the forbidden kitchen counters to play. And they call me the “dumb white kitty”! What is dumber than sitting on the patio under a sun that is hot enough to barbecue a chicken , and with your mouth wide open no less? Or how about the time that a hurricane whizzed by, broke off a giant branch of the pine tree, and there you stood, unshaken with your mouth still gaping open. Are all alligators as brainless as you? Me? Of course I took refuge under the couch as is my usual hiding place from strange humans or anything else I need to flee from. That is just good cat sense. We are the superior species over animals like you. 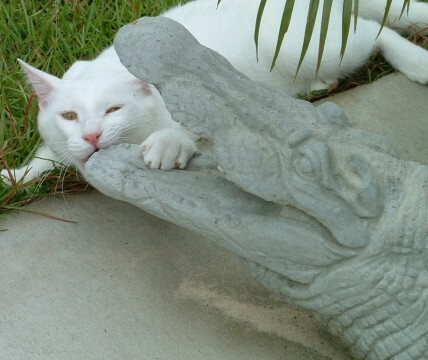 Poor gator. No one seems to bother to feed you even though you look perpetually hungry with your jaws open. I bet back in your hay day you could chomp down on a nice wild duck. No ducks in this yard, bro, just tasty cardinals and mockingbirds. They come to my yard like desperate beggars and steal food from the hanging container that my human fills every now and then. I use that opportunity to hunt them like the mighty predator that I am. I sneak as close as I can get to the unsuspecting birds that are too busy pecking away on their perch. It does not matter that the noonday sun reflects off of my brilliant, white coat which contrasts to the greenery around me, making me look like a white lily with claws and teeth. I go in for the kill. I glide through the air with one arm reaching up as high as I can, similar to the “air Jordon” move at a human basketball game. One of my claws snags the edge of the feeder without a prize. Curses, I will live to stalk another day. I take comfort in lying beside you on the cool patio as if you are a member of the family. Still your eyes never blink; you never turn to eat me. I see signs of aging and rust. Is that your tail that is broken off and lying in a flower pot? Don’t worry, you still look good without it. Maybe we have some things in common. We are beautiful but misunderstood. We are both emotionally distant creatures, yet we long for attention and love. We lay unmoving for hours as if we are part of the landscape. And we are both cherished by our humans. Life is sweet. Rest in peace, dear Frostmeister. I will miss you. I remember the first day I laid eyes on Rambo in the warehouse / sign shop where I worked. He and his brothers and sisters ran wild on the property. I took him home with me. He peeked out from under my jean shirt at my husband who covered his eyes and said, “Oh, no!” But it was a love affair after that. Rambo was so devilishly mischievous that he was delight to play with or to watch. 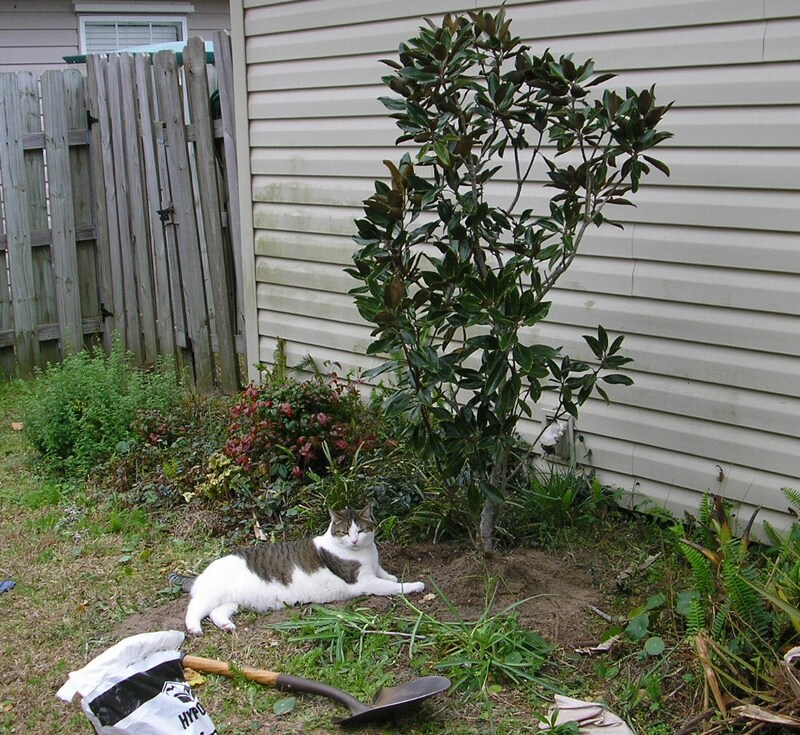 I loved to have him in the back yard with me as I gardened, trimmed the shrubs, or planted a new tree. He was my buddy. Every morning he sat at my heels or in the window as I got ready for work. But Rambo succumbed to feline diabetes. We had to euthanize him one week after my birthday in October. He acted normal up to the very end except that he stopped eating. I have never experienced such grief in my spirit as I did for that little guy. He was truly my baby boy. My grief for him was my inspiration in my first published novel Goddess of the Moon: Mayan World of Vampires when the main character, Melanna, sees her true love fall to the ground after fighting the Dark One. A mournful scream rips out of her; that was me. It was even hard for me to sit in my back yard because the memories of him haunted me. But time and a new kitty helped heal my heart. But Rambo will always occupy a corner of my heart.